The Safari Trail has a classic body with a ridge up the hood. Best guess I have is that this is Safari Trail. No documentation. The hood skirt is vy distinctive. And the square windshield? Haven't seen another one in any pics. Stock single port 1600. Nothin' fancy. Built the motor before towing it to WA in '88. Was a 6v-12v conglomeration for yrs til my son got old enough to take an interest and we 12 volted everything. Also didn't run under it's own power from about '91 til 2004. Was on the waaaay back burner. For my taste, that ol' stocker has plenty of go. 45mph in it is just about scary. Kept CA plates on it and he used to send me the tags til CA wouldn't issue them w/out a smog test. Guess that's why it sat so long. Is now licensed and street legal in WA which was no small accomplishment. Insured even. Chrome U.S. wheels with adapter to the 56 5 hole. Had a set of some kind of redstripe bias plys on it but they have a memory and for a car that's been parked so long, would take hundreds of miles to make em round again. I replaced em tho the tread depth was fine. These are stagger block bias plys on big ol chrome wheels that bolt to the 56 bug 5 hole. Hot stuff in 1973. At a few hundred miles per yr, they may well last as long as I do. Have thought about putting something with less diameter back there for more zip. Have also thought about a vacation in Tahiti. Not sure what it is. Seems to have 1st gear synchros so I don't think its a split case..(guess I could crawl under and look). My (late) bro Gary got this in trade for svcs rendered. He was one of those back yard VW entrepeneurs in Oakland CA. We used to cruise the hills in it and oft took a 12 pack to Grizzly Peak lookout to conduct the sunset. That was in about '73 or '74. May not be correct today but at the time it seemed like a smart thing to do. Left out in the rain, the body actually held water...once upon a time. As the pics show, the floor was but a memory in 2004.
unknown. Legend has it that it was built by someone in NV. Gary at one time had two of them, the other one was white and had the hydraulic ebrake gadget that would brake one side or the other. Pretty Useless in Oakland and Berkeley., it went away I know not where. I just bought a used 1600 Stock engine. Old tires, running wide 5 rims. I will keep this look with the white rims all around. '62-'67 transaxle. I haven't run the car yet so I don't know the condition. Original owner was from So Cal also. A work in progress. Still has many things that need work. She has been abused by many people over the years. She is a work in progress. 3" body lift 6 point roll bar, removed rear seat, unusable with roll bar. 205 75r 15 AS radials on Chrome 5spoke on road. 700-15 on white spoke off road. late SN# made into swing. 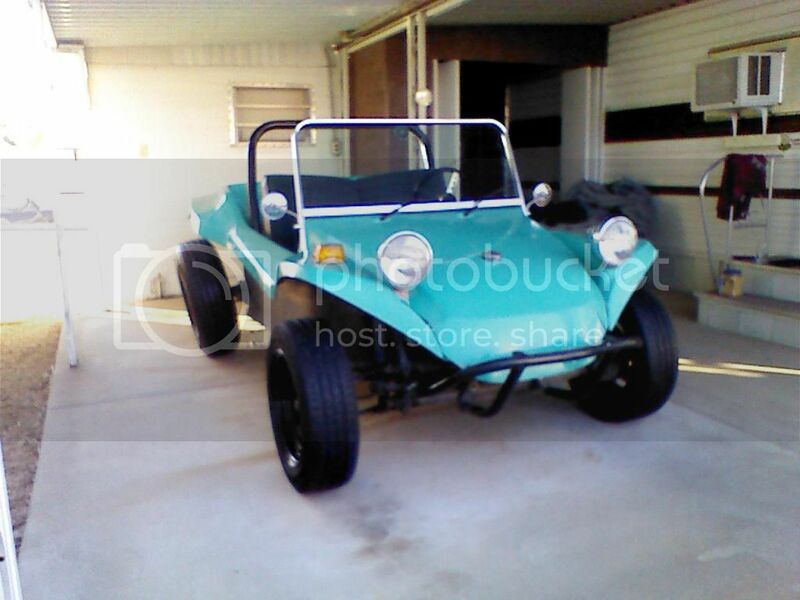 My father bought his high school buggy back, (Buggy Masters) was in the process of redoing it. His nieghbor saw and offered his for sale to us. 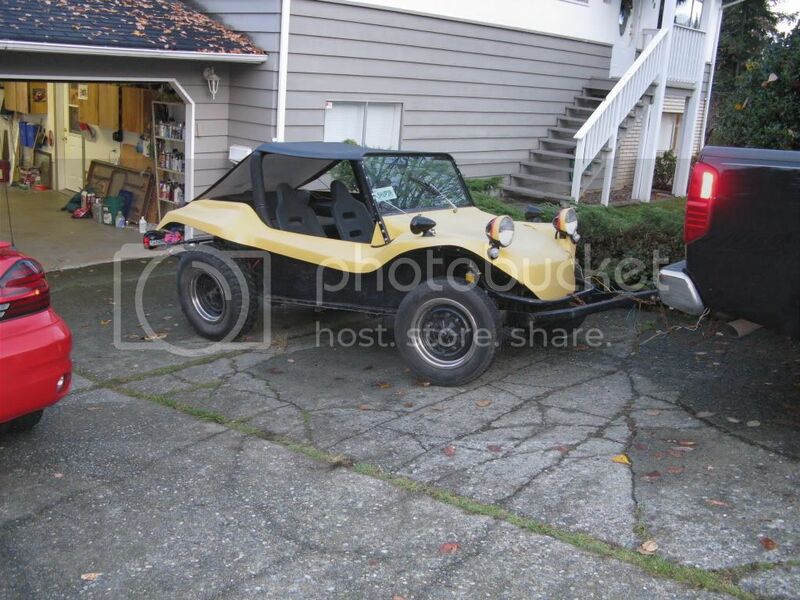 My wife and bought it, gave it some tlc, needs more, and we all enjoy the 2 buggies as a family. 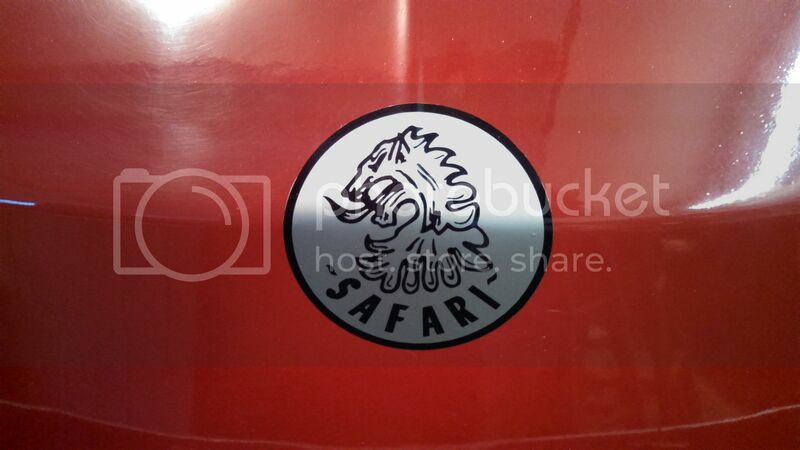 Safari Trail...ignore the Manx emblem I put on it. I had a 1978 silver anniversary corvette I had bought on e-bay and restored(I'm a certified master tech) and after having it 5-6 years the wife complained I never drove it I only waxed it...so I traded it for a Harley Ultra classic....but now I had no reason to go to the car show..well I always wanted a dune buggy so I started searching craigslist and found this on in Kentucky(I'm in Cleveland)So we took a road trip and checked it out...it had no brakes but the guy threw in a car hauler to the deal that was out in the corn field and sold be the buggy for 2 grand. Over the next year or so I redid the brakes..Converted the rears to Disc brake,replaced all the lines,welded a leaking gas tank,put in a new fuse box and rewired the dash,put some diamond plate on the dash,new carpet,new clutch,new rims and tires,with the help of the wife made a top,replaced the center link and tie rods and adjusted the torsion bars...The Buggy is named SALLY after my dog...my dog is a certified Therapy dog and we go to events at a local childrens hospital and give the kids rides in the buggy while they pet Sally...I can start this without Sally jumping inside. 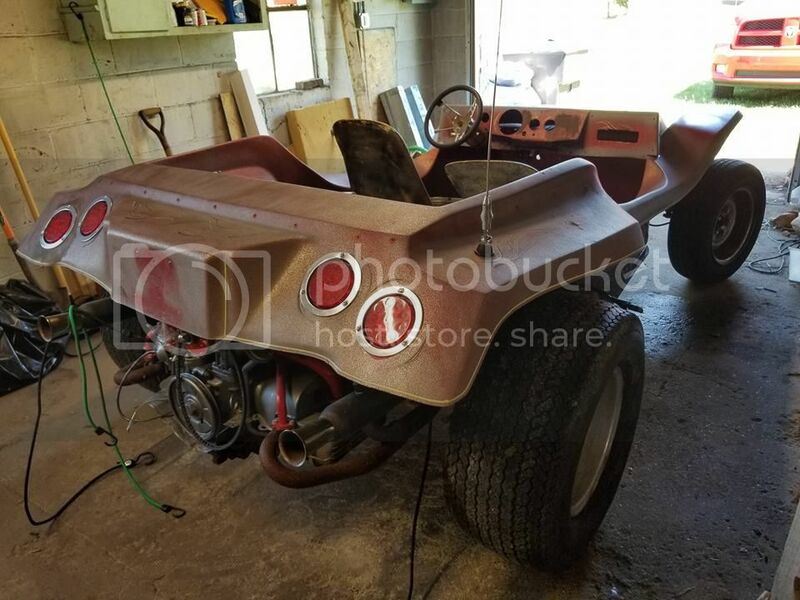 This is a Safari Trail fiberglass body from, I'm guessing the mid to late '60's. The lower hood shape, and the rear quarter seem to be pretty distinctive from what I've seen. Done. After 5 years of building, it's on the road. I've never owned a VW of any kind before, nor have I ever thought of owing a dune buggy. I saw this one in an auto repair compound with a for sale sign on it. 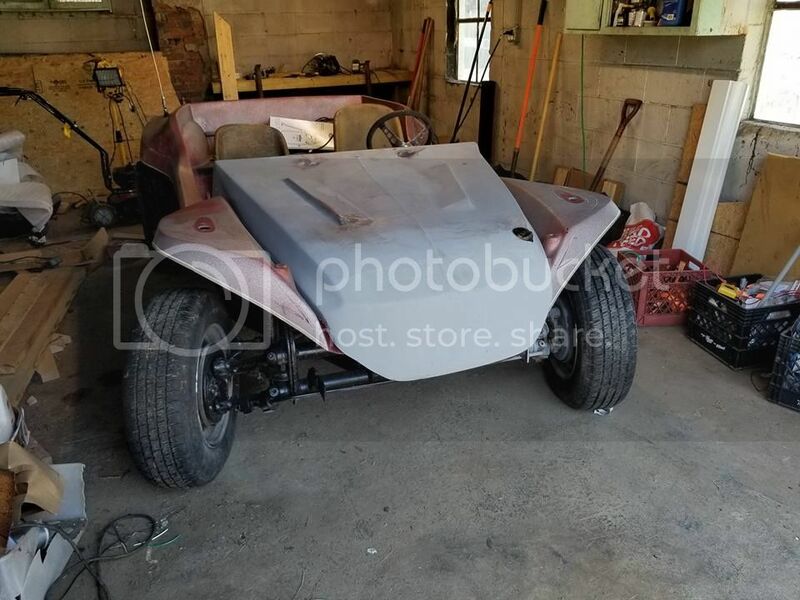 I started looking into dune buggies and got the itch. This buggie had a blown engine, and the paint was some weird flat industrial yellow. It had registration and the owner gave me a contact for a substitute engine. I bought it and towed it home. The kids were thrilled, the wife not so much. Since then I've torn it apart, repainted it and am starting to reassemble. UPDATE. As usual, project car got put on hold due to kids needs (expensive BMX sport). I'm at year 4 and am getting ready to finish it off. Don't give up. Almost sold it once. UPDATE. Buggies on the road. Took 5 years but I insured it this summer, drove it and even put it in one show. So fun. The previous owner had used this buggie for serious off roading. It had big knobby rear tires, a reinforced chassis and coil over shocks set at maximum clearance. He blew the engine and wasn't interested in fixing it. Good for me. I don't know the history before him. I bought this in the Chicago area. With plans to restoring it. The Super Safari was a standard shortened buggy with a unique nose and tail. The nose takes cues from the Corvair.